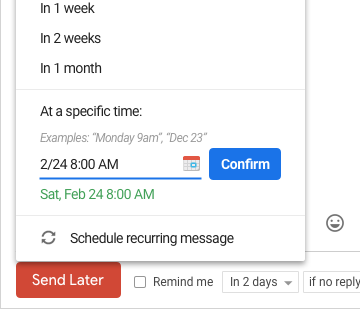 With the Boomerang for Gmail extension, you can schedule an email to be sent later at the most convenient time. Boomerang's popular “Send Later” function makes it simple for you to schedule an email to be sent at a later time. You can draft an email now, then schedule it to be sent automatically at the perfect time. Just write the message as you normally would, then click the Send Later button. 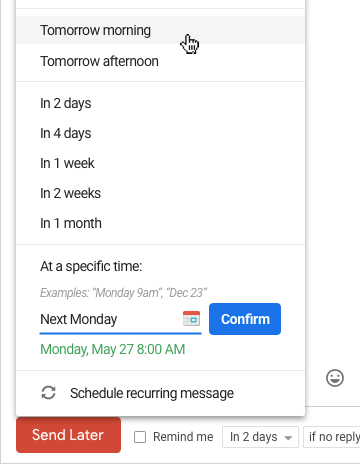 Use our handy calendar picker or our text box that understands language like "next Monday" to tell Boomerang when to send your message. We'll take it from there.